The following articles concern a famous balloon know as Le Centaur, which was sometimes referred to in the press as simply “Centaur”. The Le Centaur was well known for having set a new world distance record for a balloon in October of 1900 when it flew non-stop from Paris, France, to Kiev, Russia, a distance, (Reportedly measured, “as the crow flies”) of 1,304 miles. The Le Centaur and two other balloons, the L’Orient, and the L’Union, were owned by Count Henri de la Vaulx of France, who brought all three to the United States in March of 1906. The following article about a balloon race from Pittsfield, Massachusetts, to Bennington, Vermont, appeared in The Bennington Evening Banner newspaper on October 22, 1906. Only two balloons were involved with the race, the Centaur, and the Orient. Note: Although the article states the balloons are named Centaur and Orient, other sources identify them as being Le. Centaur and L’Orient. “The contestants in the balloon race which started out of Pittsfield at 10:23 o’clock this morning arrived here about 1 o’clock this afternoon. 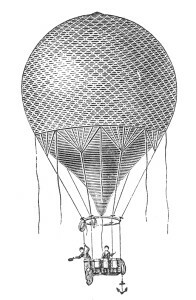 The Centaur , the larger balloon of the two, piloted by Charles T. Walsh and having as passengers Captain Charles F. Chandler and Major Samuel Reber, U.S. Signal Corps, reached the village several minutes ahead of the Orient. After passing over the village in an easterly direction the balloon began to sink. People at the house of Frank Cromack, by means of a glass, saw the balloonists throwing out ballast, but the big bag had apparently begun to lose gas. An anchor was thrown out and caught in the trees so that the occupants were in no danger of injury. The balloon still had sufficient buoyancy to keep clear of the trees and the occupants were apparently not at all alarmed. The smaller balloon, the Orient, piloted by Leo Stevens and containing Captain Homer W. Hedge, president of the Aero Club of America, passed over town in a northerly direction almost in a straight line along North Street and went out of sight shortly before 2 o’clock. Soon after the small balloon passed over the village the first of the five automobiles that started out in chase of the balloons from Pittsfield arrived , coming down South Street like an express train. The men were covered with mud and said that the trip had been a hard one. After taking in gasoline at Phelan’s Garage the automobiles again took up the pursuit of the larger balloon. The following article appeared in the Abilene Weekly Reflector on October 25, 1906. “Pittsfield, Mass. Oct 23 – Two balloons, Centaur and L’Orient, which remained here after the aero-automobile race between balloons and automobiles for the Hawley Cup had been declared off last Saturday , participated in an endurance contest Monday which carried them miles over northwestern Massachusetts and southern Vermont. The balloon L’Orient outsailed the Centaur by about three hours and a half, finally landing in the little mountainous town of Jamaica in Windham County, Vermont, 57 miles from the start. The Centaur came down in Bennington, Vt., 30 miles from this city. The balloons rose from here at 10:20 a.m. The Centaur carried Charles T. Walsh, pilot, and Maj. Samuel Reber and Capt. Charles F. Chandler, of the signal corps U.S.A. L’Orient was piloted by Leo Stevens, who had as his companion Capt. Homer W. Hedge, president of the Aero Club of America. The balloons were in sight of each other for about three hours and after them sped three automobiles which had been entered in the Hawley Cup contest on Saturday. The Centaur was slightly behind L’Orient in crossing the Vermont border, and after getting over Bennington, Pilot Walsh decided to land. The descent was successfully accomplished on the slope of Woodford Mountain. The occupants of the Centaur said on landing that they considered their object accomplished and that their trip has been highly successful from a scientific standpoint. The Centaur reached a height of 6,200 feet. After seeing the Centaur descend, Pilot Stevens of L’Orient decided to keep on. Twenty-seven more miles of southern Vermont was traveled and at 4:30 L’Orient came down in Jamaica. Mr. Stevens said after landing that L’Orient went 8,000 feet into the air. Above the clouds the heat was so intense that all outside clothing had to be discarded. At one time the thermometer registered 106 degrees. Twenty-five minutes after Centaur landed in Bennington an automobile driven by Floyd Knight of this city stopped by the side of the car. Half an hour later an automobile owned by C. F. Bishop of Lenox arrived on the scene. The trip would have lasted longer, but the aeronauts didn’t want to cross Long Island Sound, so they quickly brought the balloon down from an altitude of 3,000 feet in only 90 seconds. Captain Hedge suffered a minor injury climbing down from the balloon. The Le Centaur, was later wrecked in late May of 1907 when it again rose from Pittsfield, Massachusetts, and developed two tears in the balloon envelope caused by a rapid expansion of the buoyant gas inside due to the heat of the sun. The craft came down near Middlefield, Mass., and both men aboard, Leo Stevens, and Harry Markoe, escaped unharmed. It was reported that the damage to the balloon was such that it could never be used again.